High quality scale model of the Big Ben Building with 3 different light effects! Build your own light up Big Ben with this Ravensburger Big Ben 3D Puzzle Night Edition. Big Ben is one of the most prominent landmarks in England and the largest bell in the Elizabeth Tower of the Palace of Westminster in London. The delightful ensemble is especially magnificent once darkness has fallen and the neighbouring Houses of Parliament are bathed in a warm, golden glow. Big Ben shines in a fabulously atmospheric light. 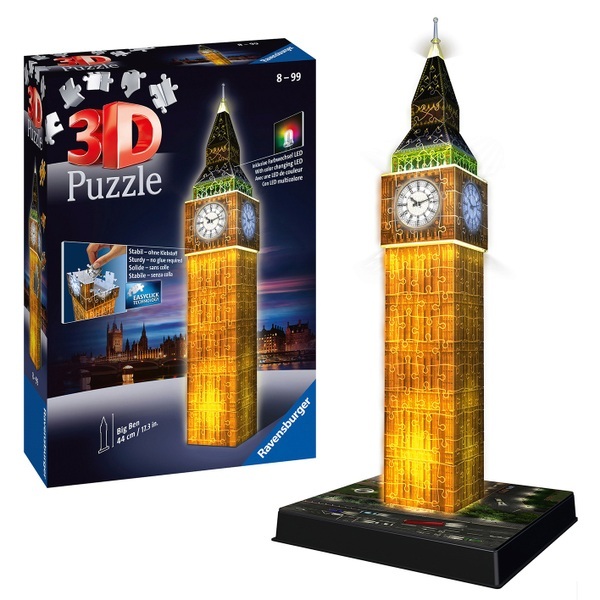 This "Night Edition" Big Ben 3D puzzle uses LED technology to create 3 different coloured lighting effects. The completed puzzle will glow with a green, yellow or a red light automatically changing to make this an effective and dramatic addition to any room. The puzzle uses unique hinged plastic pieces which slot together to build a sturdy and strong "building". No glue required! The Big Ben puzzle has 216 high quality plastic pieces and measures 44cm tall when complete. Each puzzle piece is printed with a number on the reverse side so you can either assembe the puzzle by eye or just by following the numbers. Puzzle comes with a printed base board so it can be displayed on a shelf or table top. Enjoy one of the world's most famous buildings in your own home!